Home › Forums › Clamoring for Change › Change is not something “others” need to do; it’s something we all need to work towards. This topic contains 7 replies, has 8 voices, and was last updated by John Mai 4 months, 1 week ago. As a way of provoking curiosity and pushing participants to evaluate their position on particular topics, all forum discussions are designed with a “provocative statement” as the basis for the discussion. Participants should respond to the forum statement with “strongly agree,“ “somewhat agree,“ “unsure,“ “somewhat disagree,“ or “strongly disagree“ and then in their comments explain why. I agree with this statement. We all need to work towards making a difference in the world, and that starts with change. Everyone must participate in order for the change to be noticeable. It starts with the individual. In order to see a change in society there must be a change by the individuals in the society. Change is something we all need to work on because even when we think something is ideal, there is always room for improvement. For example, during the election season not all of the eligible voters actually went to the polls to vote because they were uneducated, did not care about the election, or did not have time to vote. How can you make a difference if you do not participate? You can’t. We cannot watch from the side lines hoping something will change, everyone must help make a change in order to make a difference in the world or else nothing will change. Change is something we all need to work towards together. Like Kate, I agree with the statement, “change is not something ‘others’ need to do; it’s something we all need to work towards.” How can we, the people, expect anything to change without taking part in the change ourselves first? That is the key actually. Most people think change is difficult because they look at trying to change the whole world at once rather than working to change within themselves and set an example for the rest of the world. Change is a process that can only begin with the individual because nobody has the power to change another individual, so if everyone begins by changing themselves, they can promote self-change which could help change the society as a whole. Another reason why people may believe change to be difficult, or do not want change at all, can be clearly understood in a statement made by Kay McLaughlin in her Talking Together Getting Beyond Polarization Through Civil Dialogue, where she stated, “it is not change itself we fear, it’s the changes that we will have to make to accommodate the change that scare us” (McLaughlin 62). In order for everyone to be able to work towards to what may seem impossible, there needs to be a little more discipline, desire, time and effort out of every single individual. I very much so agree with this statement. I am often someone who fears different types of change, I find comfort in familiarity and routine. However, as I’ve matured and been exposed to many kinds of change (good and bad) throughout my life, I’ve found that change starts with one individual – yourself. As a way to do this, one might need to reflect on themselves and figure out their core values and beliefs. When faced with a situation that could lead to potential change, they may look at who they are as an individual, and how they can deal with the situation at hand. While being considerate of others among them. This all being said, I am also sometimes a person who sits back and waits for people to act on something for me. I expect that someone will do the job and the change will just happen, I don’t have to worry about it. I have discovered that this is quite possibly the worst habit to get into. Since I have been old enough to vote and understand politics, I have tried to break this habit. I have attended protests and marches and voted whenever I have the chance. Even though I am young and still trying to figure out my purpose and inner values, it is still important to make my voice heard. We all need to realize that even in the midst of a crowd, our voice will only make that crowd louder. We always will be heard. I very much agree with this statement. Before taking my religion class, Clamoring For Change, I was never really a person to initiate change that I wanted to see. I would wait for someone else to start the change and I would tag along and join them but now that I have taken that class, I see now what I was doing was not helpful at all. I shouldn’t have waited for others to make the change that I wanted to see. I should have started with myself to start making the change. When people work together on change, it is much more productive and has a bigger impact. Even though change does need to start individually, it does make it so much easier to be in a group of people who all want to see that change too but that change cannot start until everyone that wants to see that change has changed themselves first. I have always been the type of person to get overwhelmed with the idea of change because I always asked myself, “where do I start” and “how do I start”. But now I know that the answer to both of those questions is myself. I do not need to change the world all at once. I need to change myself first so that I am able to move forward and begin to see the change that I am working for but I cannot do that if I am not changed myself. I strongly agree with this statement because I believe that there should be a collective effort in creating change. I think that it is very easy for us to place blame on others and to assume that we are not the ones that need to change. I am a big believer that in order to create change there needs to be an individual change as well as a collective change that takes place.I think that a lot of the time we believe that we are not apart of the problem and that we are not the one that needs to change.The idea of change turns into a who’s right and who’s wrong which isn’t what change is about. Change is about coming together to make a collective effort to change the world. I find it frustrating and a waste of time when we blame others for not changing when the thing that may need to change is us. I also think that a lot of the time when we think that others need to change instead of ourselves it is simply because we are lazy. We so often want to create change but are unwilling to put the effort in to do so. Once we start taking action and stop placing the blame on others then we will be able to create the change that we want to see in the world. I, like everyone else, agree with this statement. As Shianne mentioned in her post, before taking Clamoring for Change this semester, I was one of those students who just tried to blend in with others and hoped for the best. I did not really participate in making the world a better place because I didn’t think that my voice mattered in the larger picture. However, there have been many moments on Luther’s campus where I have seen change happening. For example, after the hate incidents that occurred, I went to the sit in at the union and was very surprised at how many people actually showed up at the event! This moment showed me that if we as individuals ban together to make the world a better place, success will prevail. However, as Kate stated, if we continue to stand on the sidelines, no progress will be made. It takes individuals working together with others to create the change we want to see in the world. I strongly agree with this statement. 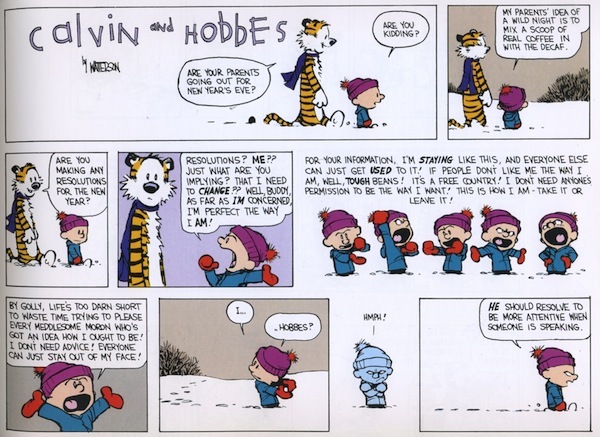 It reminds me of a comic strip from Calvin and Hobbes, where Calvin talks about his New Year’s resolutions. In the strip, Calvin rambles on and on about how is unwilling to change who he is, and if people have a problem with him, that is not his problem! The satire of putting these words in the mouth of a six-year-old is humorous. I agree with the statement because I see imperfections in the world and I know I am part of the problem. Sociological issues are embedded into the society that I have been raised in and am now a part of. I cannot, with good conscience, point the finger and not take responsibility for these issues. Change in society will not occur unless individuals recognize the need for personal change, myself included.